Bring your party to Miami and take a 4-hour cruise along the beautiful scenery of Biscayne Bay! 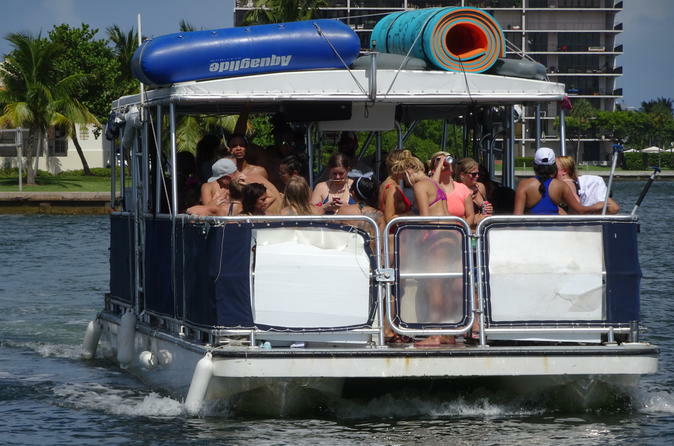 The 40' USCG0-approved Party Pontoon boat will comfortably carry you together with 20 friends and family for an unforgettable party cruise. Bring your own alcohol and enjoy our open deck boat for drinking and dancing to your own music via our sound system. Choose from 3 departure times: 11am-3pm, 3pm-7pm or 7pm-11pm for a 4-hours of joy on the Miami and Miami Beach waterways! This boat will carry 20 friends and family, but must be booked by one individual traveler. If you want to add more guests (more than 20) than each Additional Guest is $60 (Billed Separately) for up to a total of 39 passengers. The party cruise departs from the Sea Isle Marina. Make sure to bring your own alcohol to enjoy! The captain will have a pre cooled cooler on board, Just bring your drinks. After everyone and their belongings are aboard, you will cruise around Biscayne Bay, enjoying the view of the exclusive private islands and their amazing properties. We continue toward Star, Palm, and Hibiscus islands where the rich and famous reside. We will tour the beautiful houses and mansions just before stopping on one the islands for a break. On the island (Monument or Pace island) you can join an on going party or continue your own! After 4 hours, the cruise will head back to the marina for you to continue the party at your next destination.